The Olympic Games are fast approaching and the history books are evidence of how much India has underachieved at the biggest stage of sports. But for those who fail to understand why despite 1.3 billion inhabitants, the emerging economic power's medal haul has been paltry in Olympics, the tale of Walmiki brothers would be an eye-opener. A 10-by-10 square foot dilapidated shanty situated in the darkness below a flight of stairs which leads to Marine Lines station located in urban Mumbai, India’s financial capital, is the residence of Devindar Walmiki, currently in the Indian Hockey squad for Rio 2016. With him live six other family members which include his elder brother Yuvraj Walmiki, who has represented India in more than 90 games which include the World Cup and Asian Champions Trophy. There is also Anup Walmiki for company, who recently represented India at the South Asian Games. Till 2011, it wasn’t electricity which lit up their house but the sparkling trophies on the shelf handmade by Walmiki’s father, who is a driver and earns just Rs. 6,000 a month . These three brothers have grown up in extreme poverty and have been forged by suffering. They are not men from privilege but have overcome every obstacle to achieve their dream of representing their country through sheer hard work. There have been times when they have just had one meal a day but they have satisfied their appetite with the hunger to succeed on the hockey field. In 1928, the Indian team won its first Olympic gold medal and until 1956, the team remained unbeaten in the Games, winning six gold medals in a row. India also won the 1975 World Cup. Having won eight Olympics gold medals till date, India is the most successful team ever at the Olympics. That makes it all the more surprising that some of its hockey heroes have to go through so much hardship. If these brothers were cricketers, they would have been living a lavish life and driving sports cars. Unfortunately they play hockey, where very few incentives are provided to the sportsmen who excel. If that wasn’t enough, false promises made by the Government increase their suffering even more. To consider India as a land of a growing sports culture is a farce. Cricket is what rules this country. A state level cricketer will always have more money than an international hockey or boxing player. In 2011, when Yuvraj Walmiki scored the winning goal to help India clinch the Asian Championship against Pakistan, he was deemed a local hero and was promised by then Mumbai Chief Minister, Congressman Prithviraj Chavan, a home and a grade II government job. Their story has been covered by a lot of publications and news channels but the Maharashtra government has completely ignored their pleas. Things have descended to the extent that the ex-chief minister has gone on record saying that he doesn’t remember making any such promises. Yuvraj is currently employed by Central Railways and is an Indian team discard. However, he is working day and night to get back his place on the team and is shuffling between working as a ticket collector during the day and as a hockey player at night. He uses the money from his salary to fund his and his brother’s training and to support his family. Meanwhile, Devindar is preparing with the Indian squad to get India a gold medal at the Rio Olympics 2016. Devindar Walmiki is now the only hope the Walmiki family has for them to lead a decent middle-class life. Not only that, but his success has also inspired Yuvraj to make a comeback to the Indian side. Yuvraj says, “I think when I missed 2012 Olympics, it was the worst moment of my life. I was so close to my dreams and no one in the world could have taken it away from me. But my injury was very unfortunate. It's every athlete's dream to play in the Olympics but God had other plans. Yuvraj would've been forgiven for being bitter about Devindar's success, but he's anything but that. He says, “When Dev got in the team, the pride me and my family felt, nothing could beat that. When his name was called, I felt ecstatic. A chill ran down my spine. That moment had healed some of my wounds. The first game he plays, my entire grief of missing out on two Olympics would be healed. “I have seen him grow as a player. He learnt it from me but all his achievements are due to his own hard work. I will always guide him to do the right things all my life as I am both his friend and elder brother. We were all crying tears of joy on his selection. And after that night before sleeping, I was so motivated and saying this to myself – Yuvraj you can play again. “Dev's selection has rejuvenated me and given me hope. I have a tattoo called 'Believe' on my hand. The self-belief I have is incredible now. I am not saying this out of overconfidence but because I am working hard. 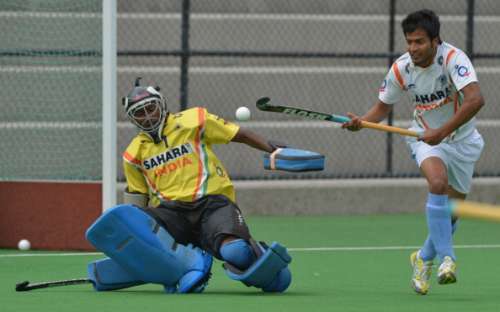 I will prove to be one of the best forwards in Indian hockey. I had a name plate in front of my house saying 'Yuvraj Walmiki's house’ and now I have ordered to change it as 'Devindar Walmiki, Olympian," Yuvraj finishes. Yuvraj and Devindar are just two brothers out of thousands of other kids raised in poverty who are taking up sports to change their fortunes. But if their efforts and achievements are ignored, the hopes of all those other aspiring sportspersons could be shattered too. While the Walmiki brothers have defied odds and succeeded on their own to bring glory to India, the Maharashtra government has failed miserably to honour them.